Rainbow activities are everywhere right now! An easy way to add to the rainbow fun is with colorful rainbow snacks. 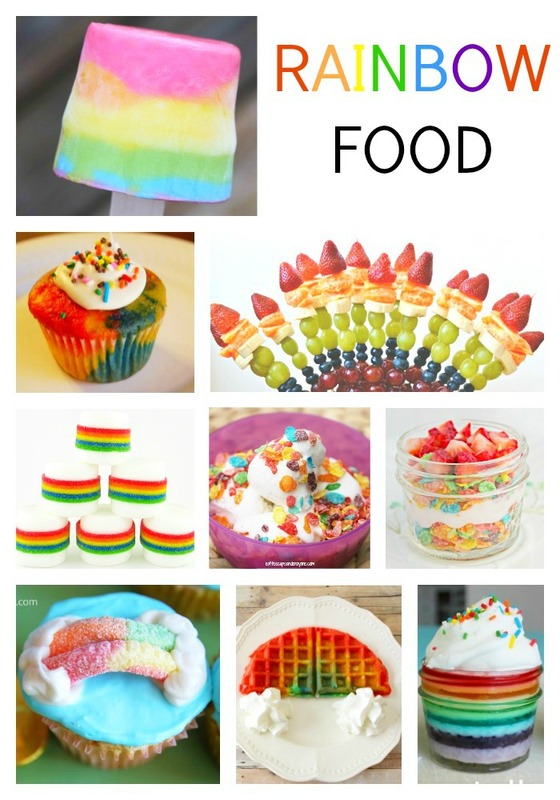 I’ve added a list of rainbow foods that are kid-friendly, look super yummy, and quite pretty! Inviting your kids into the kitchen to help whip up a batch of rainbow waffles or rainbow fruit kabobs are great ways to encourage trying new foods. And I don’t know anyone who could turn down a rainbow treat! 1. Rainbow Yogurt Popsicles. Whether you use small glass jars or paper cups, the frozen yogurt popsicles are the perfect healthy treat as the weather warms up! And if your little one has a hard time adding the colors carefully with a spoon, add the colored yogurt to a ziploc, cut the corner, and squeeze the colors into rainbow layers! 2. Rainbow Jell-o. We make rainbow Jell-o each St. Patrick’s Day or Easter in our house, but it looks so much better in the individual jars! These could also be used as a great peanut-free alternative to school birthday treats! 3. Rainbow Fruit Kabobs. In my experience, if you put it on a stick, kids will eat it! For some reason kabobs are so inviting and the rainbow fruit kabobs from Simple Inspired are no exception! 4. Rainbow Wrapped Marshmallows. Three simple ingredients and a few minutes of time and these bite-sized rainbow marshmallows from Smart School House the perfect way to indulge without over doing it! 5. Rainbow Ice Cream Sundaes. Crunchiness and creaminess combine to form a colorful and yummy rainbow ice cream sundae! 6. Rainbow Waffles. The waffles look so yummy that my kids are insisting that I make these rainbow waffles from Pinky Princess Girl for dinner tonight! 7. Rainbow Cupcakes. Swirling colors couldn’t be more fun! Try these rainbow cupcakes from Kids Activities Blog. 8. Rainbow Birthday Cake. You can probably literally taste the rainbow in this rainbow layered birthday cake from Crystal & Co.! 9. Rainbow Decorated Cupcakes. I made similar cupcakes when my oldest turned 6 and love Living Locurto’s rainbow decorated cupcakes with the gummy worms! 10. Rainbow Yogurt Parfaits. The colorful possibilities are endless with the yogurt parfaits from The NY Melrose Family! And again, the little glass jelly jars add to the rainbow fun! All of these would be fun to make with your kids after school. Spring is a great time to add a little color to your life…and your food! Thank you so much Megan for including our Rainbow Yogurt Parfait. Pinning! That parfait looks so yummy and easy! Thanks so much for including my rainbow waffles!! Those waffles are so much fun!!! I love these! Great ideas! Thanks so much for including our Rainbow Yogurt Parfait!